of Aboriginal peoples in the life, culture, and heritage of Canada. the quest for a better future. Grades 1-6 consists of ten titles per grade: (three traditional stories, four modern stories, and three informational texts). The titles cover a range of levels appropriate for the grade. The grades 4-6 books are a bit larger and each grade offers one novelette for more sustained reading. The titles for grades 7-8 are presented in an engaging magazine format. Each magazine is built around a theme and features a variety of levels, text forms, and cultural areas. There are four 48-page magazines at each grade. The stories within Turtle Island Voices are told in many parts of Canada. “Turtle Island” refers to the continent of North America, based on the creation stories of many Aboriginal peoples. Though the stories vary, many tell of the continent being created on the back of a great turtle. Integrating Turtle Island Voices into the classroom not only helps to foster a sense of identity among Aboriginal students, but it also enriches all students with First Nation, Métis, and Inuit perspectives. 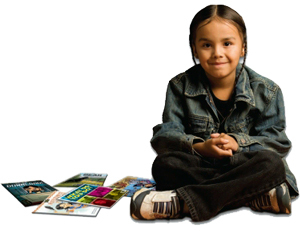 Turtle Island Voices honours the histories, cultures, worldviews, and knowledge of Canada’s Aboriginal communities with exciting stories, information, and graphics that will pique students’ interest in learning about Aboriginal peoples and cultures.